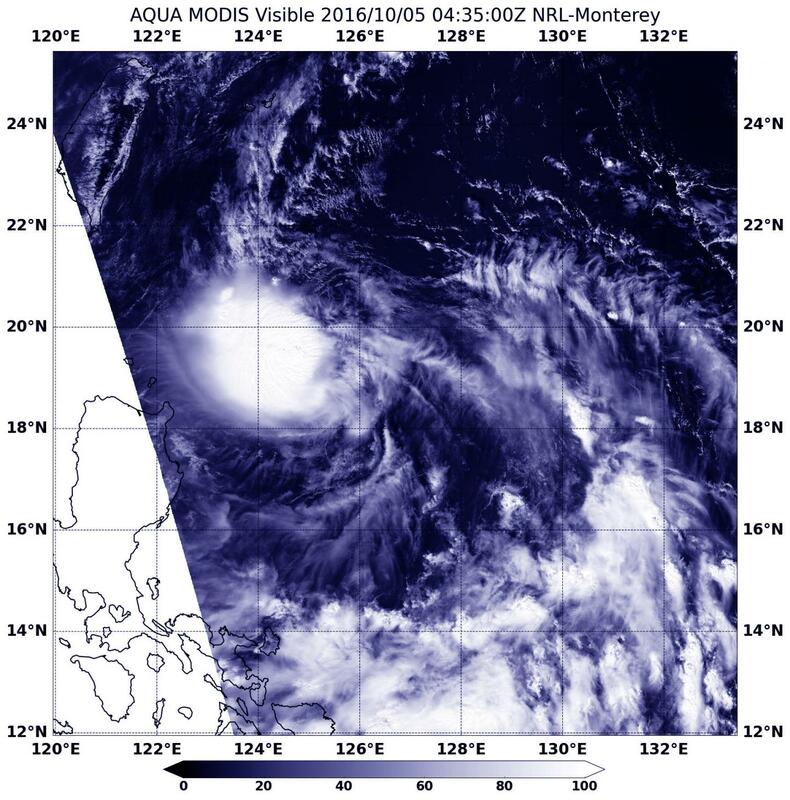 The Moderate Resolution Imaging Spectroradiometer (MODIS) on NASA's Aqua satellite captured a visible image of Tropical Depression 22W (TD22W) on Oct. 5 at 12:35 a.m. EDT (0435 UTC). The image showed strong thunderstorms around the center of circulation, but the center appeared somewhat elongated. That's because the storm is dealing with moderate vertical wind shear. At 11 a.m. EDT (1500 UTC) Tropical Depression 22W had maximum sustained winds near 29 mph (25 knots/46 kph). It was centered near 19.7 degrees north latitude and 122.8 degrees east longitude, about 327 nautical miles north-northeast of Manila, Philippines. TD22W is moving to the northwest at 24 mph (21 knots/38 kph). Tropical Depression 22W is forecast to track to the west-northwest over the next several days and its center is expected to move over open waters and pass between Luzon, northern Philippines and Taiwan.